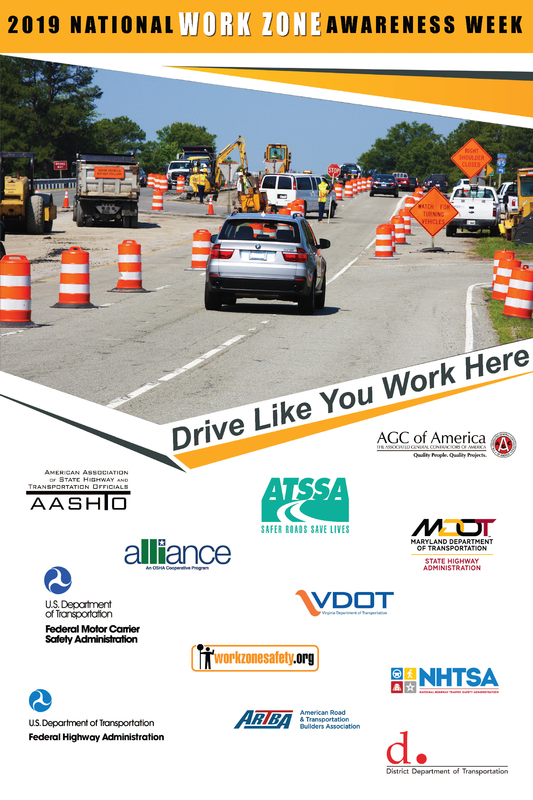 ​National Work Zone Awareness Week (NWZAW) is an annual spring campaign held at the start of construction season to encourage safe driving through highway work zones. The key message is for drivers to use extra caution in work zones. Learn more about the history of NWZAW, including previous kickoff event host states, themes, posters, and more. The American Traffic Safety Services Foundation is a non-profit that supports the loved ones of those impacted by work zone crashes. The Foundation has the National Work Zone Memorial - featuring the names of more than 1,400 individuals killed in work zone crashes- which travels to sites across the country each year. This mission to spread awareness for work zone safety aligns with the mission of NWZAW. NWZAW is held each year at the beginning of the roadway construction season. The awareness week is shared nationwide and each year a state department of transportation (DOT) hosts a kickoff event for NWZAW. State DOTs must apply to host the NWZAW kickoff event in their state. Have questions about NWZAW? We'd love to hear from you.